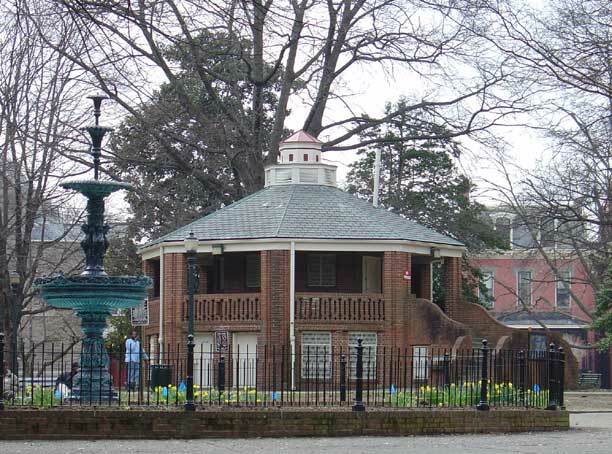 Monroe Park is the oldest park in the city of Richmond. It is centrally located and utilized by VCU students, downtown residents and has become a hub for the homeless population of our city. There are plans to renovate the park which would require it’s closing for up to two years. The plans for the park’s future are impressive with a new playground, outdoor theater , more functional grounds , restoration of the fountain, improved restroom facilities and maintenance of aging infrastructure under the park. The plans are exciting and will certainly improve the attractiveness of the park and our city. The issue is not whether or not the park needs a face lift, the issue is what will happen to the hundreds of indigent and impoverished individuals who congregate at the park and the Christians who connect to the homeless by providing services in the park? I decided the best way to understand this issue was to visit with the folks who were in the park today. We met many homeless friends, some who were unsheltered, some sheltered, some formerly homeless and some newly homeless. Some came to get food and clothing, others for the fellowship. Some played chess, others gathered for conversations on benches, while others napped in the grass or beneath the massive trees. Thomas is a graduate of The Healing Place and has been clean for several years, but comes to be reminded of where he came from. He said the park reminds him of the serenity he now has and the insanity that awaits him should he return to his old ways. Thomas’s nickname for the park is “Destitute” park. He sees the park primarily as a gathering place for people who have lost their way. While visiting with Thomas, a CARITAS client from the women’s shelter shared that she wished there was a central site for the homeless population. While she likes the park, she sees the greater need being services that would help them move beyond their current circumstances such as assistance in finding employment. Our new friend Shorty also felt the need for employment was a far greater need than the need for food and envisioned a site where people could access computers, phones and receive help in finding jobs. Like many who receive services in the park, Shorty had no interest in going into a shelter. He had been in and out of shelters and felt his best option was to go it alone. We also met Christians from all over the city who came to live out their call to be Christ in the world by serving those in the park. They came from Chesterfield, Mechanicsville, the West End, and city congregations. They came in groups, as families and some as concerned individuals. They gave out clothes, drinks, snacks, sandwiches and some even brought hot meals. We witnessed two different meals distributed in the few hours we were in the park. Each time the food arrived more than 60 individuals would quickly, politely and quietly line up to receive. I saw many of the same faces in both feeding lines. Perhaps the sandwich was being saved for dinner and the hot meal was the day’s main course. We asked a group from Enon UMC what the best alternative to providing services in the park would be and they stated that it would be nice if there was a coordinated effort to provide services at a central site. We also met a couple from Chesterfield who also felt a coordinated effort at a central site would be ideal. This was our Chesterfield friends first time in the park. They shared that their ministry has wanted to connect to those in need and had been searching for ways to connect in Chesterfield but could not figure out how. They were thankful that the cloths and blankets would find a new home. John’s face is the face I will remember from today’s visit. John worked for 40 years at a local radio station and had recently retired. He tried to help out a friend in need and in the process somehow ended up homeless. He had been sleeping on the streets of Richmond for about a month. He said the first week he was harassed but has since learned how to navigate the streets and has found a safer place to sleep at night. He seemed confident that his housing challenge would be solved as soon as he got his social security check next week. He was resistant to the idea of going into the shelter for fear of being harmed or robbed. I gave him my card and he assured me that he would give me a call should he change his mind. We met homeless friends from every demographic, from age one to the elderly. Some suffered from obvious mental illness, others appeared to be trapped in addiction while others just seemed to be down on their luck. What struck me was the level of community that seemed to exist in the park. People seemed to know one another and while no one was overly friendly, they were all willing to talk with us and share what they knew about the services in the park. They all had opinions about what should be done. It was obvious that the park represented “home” or at least a place of connection for many. The most hopeful story of the day was from Dot and her friend Joey. Dot met Joey in the park a while back. She started taking Joey to her church on Wednesday nights and helped him find housing. Even though Joey now has housing he still comes to the park for assistance. When we met Joey he was trying on a new sweater from our Enon friends. His face lit up when he saw Mrs. Dot as did hers. It was a story of friendship and real life change not only for Joey but also for Dot. As we observed congregational groups, some members held back, placing their goods out for the homeless to take without much need for interaction. While others actively engaged the park residents in conversations and seemed open to responding to deeper needs if called upon to do so. While we were in the park, Dot connected with Shorty and we are all hopeful she can help him the way she helped Joey. While Dot is connected with Shalom Baptist, she comes to the park out of her own call to serve. That was a common thread. There were not large groups of congregational volunteers but more individual Christians who had deep convictions about serving those in the margins of our society. One group we met consisted of four adults serving together. They represented three different congregations and had connected around passion for Christ and compassion for the homeless. In my last post, I shared the importance of the Borderlands. The park is a “Borderland” in a world where the “Borderlands” are rapidly disappearing. If the park does close for up to two years, what alternatives can we as a city come up with to insure the homeless continue to receive services and that people of faith have a place to connect with those who are most vulnerable in our city? I wonder what would happen if all the churches who serve the homeless in the park and those concerned for the homeless population in our city came together to pray and collectively seek God’s guidance around this issue? Thursday night Councilman Samuels is hosting a forum on this issue. Homeward has invited Embrace Richmond to help facilitate a portion of the conversation. Find out more about this event here. Boy do I wish I had read this sooner so that I could have been aware of the hearing being held. While our family’s ministry in the park had to end so that we could be certain to pay our own mortgage and food bills, I learned so very much in my time working with the folks in the park – both our “customers” as well as the others that came to serve. Even a couple of years ago, we felt the impending threat of loosing the park for these folks and the frustration in not having a better resource to work collectively to minister to these folks. I still have a vision in my head of the kind of a place where all of those who are called to serve can meet the needs (including those esoteric needs such as empathy, acknowledgement, compassion and love) of those who need access to resources. A critical aspect of any conversation, of course has to be enpowerment and transformation. I truly miss involvment in ministering to HIS least and lost – this dialogue that seems to be surfacing as a result of the park definately has me seeking a method for re-engaging despite current circumstances. Would love to have your voice at the table. We are thinking of trying to get some of the faith community leaders and other non-profits together who expressed a desire to work collaboratively. If you want to join us, shoot me an email. We are trying to figure out how the downtown churches are going to respond and then figure out how we can support them in their efforts. I will keep you posted.